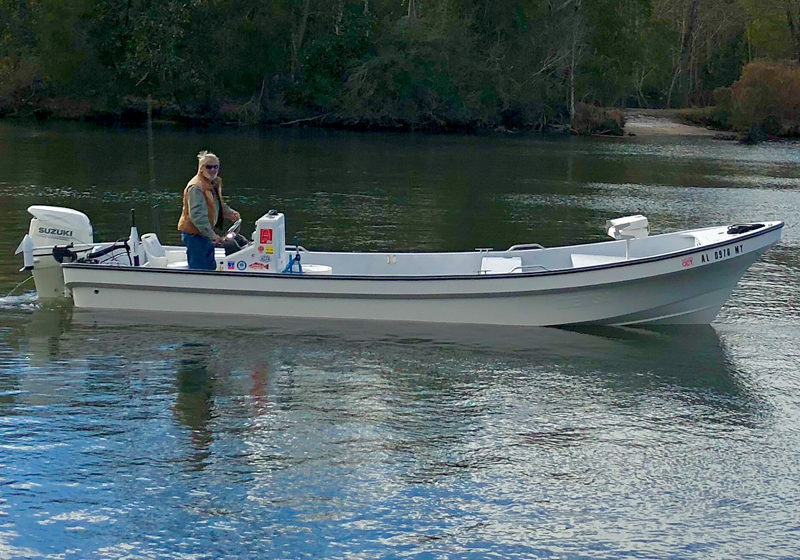 Editor’s Note: Captain Mike Wilson of Silverhill, Alabama, guides on Alabama’s Gulf Coast. I asked him what he’s catching now from mid-August – the first 2 weeks in September. 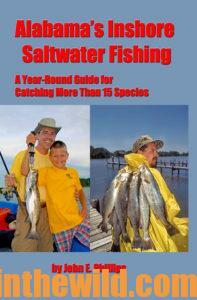 This report will apply to all of the Upper Gulf Coast and tell you what you can expect to catch while fishing then. Wilson not only fishes the Gulf of Mexico but also Mobile Bay (http://www.mobile.org/includes/content/docs/media/Regional-Map-June-2017.pdf) and the rivers that feed the bay and the Mississippi Sound. In the hot weather of August and early September, speckled trout may be hard to find. We’re primarily catching schooling trout, 14-17 inches long with an occasional 6-7 pound speckled trout. 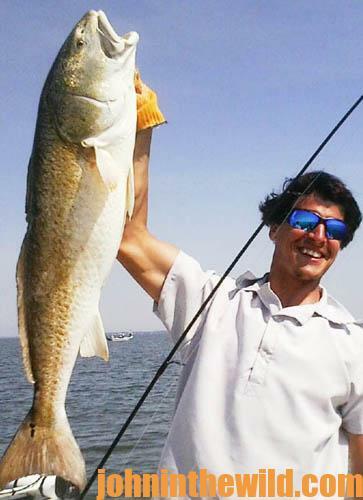 Redfish are still somewhat plentiful, and white trout are very abundant. We’re still picking up a few flounder ever now and then. 2018 has been a strange year for fishing in that there are a tremendous number of people fishing for and catching Florida tripletails. 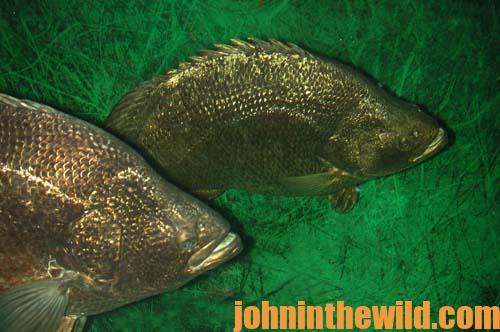 In the past, only a few locals and some fishing guides have fished for tripletails. 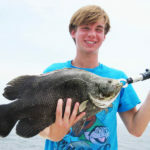 But this year has seen an explosion of anglers fishing for tripletails. 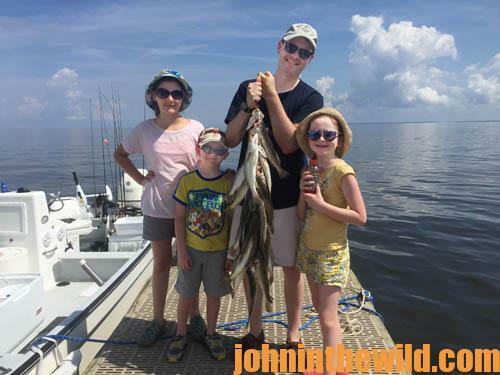 We’re catching most of our speckled trout around the gas rigs in the mouth of Mobile Bay and the inshore artificial reefs (https://www.outdooralabama.com/artificial-reefs/inshore-reef-zones) the State of Alabama’s Marine Resources Division (AMRD) and conservation organizations have created in the past few years. Before school started back, the inshore reefs were receiving quite a bit of fishing pressure. However, since most children and youth are back in school, the reefs and the rigs are experiencing far less fishing pressure. 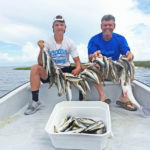 Actually for the foreseeable future, there should be much less fishing pressure on saltwater and brackish water fish on the Gulf Coast, and inshore fishing should be much better than in the summer. We had been catching some very-nice specks on the Gulf side of the Ft. Morgan peninsula (https://itouchmap.com/?d=1730486&s=AL&f=cape) in Mobile Bay for about the first 20-30 minutes before daylight. But right now in mid-August, the water is gin clear, and once the sun comes up, the speck bite stops. 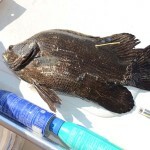 Until mid-September, I’ll be targeting tripletails, if that’s what my customers want to catch. The heavy pressure of the summer is gone now, and I believe the tripletails will be more dependable than they have been. Speckled trout and redfish should be easier to catch now and in the next 4 weeks. We can load the boat with white trout too. Last Saturday in early August, a friend of mine and his party caught four tripletails, which was a very-good day of tripletail fishing. One of the four fish caught weighed 28 pounds. 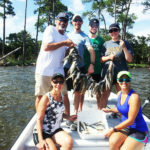 To learn more, you can contact Captain Mike by emailing bamainshoreslam@gmail.com or calling 251-747-6941. On Facebook, go to https://www.facebook.com/bamaslam.inshore/ where you can see his photos of the fish he and his parties have caught. 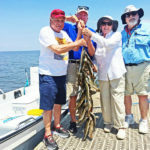 You can learn more about fishing parts of the Upper Gulf Coast from John E. Phillips’ books, the Kindle and print versions of “Alabama’s Inshore Saltwater Fishing: Year-Round Guide to Catching More Than 15 Species” at https://www.amazon.com/dp/B009EZR046; the Kindle version of “Catch Speckled Trout and Redfish: Learn from Alabama’s Best Fishermen” https://www.amazon.com/Catching-Speckled-Trout-Redfish-ebook/dp/B00CWE3O6O/; and the Kindle and print book versions of “Fishing Mississippi’s Gulf Coast and Visitors’ Guide” https://www.amazon.com/Fishing-Mississippis-Coast-Visitors-ebook/dp/B008DWLUZ6/.